What was it like as one of the few female performers in the New York Philharmonic in the 1960s? We sat down with cellist and author Evangeline Benedetti to hear ask this and other questions about performance and teaching careers, favorite composers, and life behind the doors of Lincoln Center. What was your most memorable musical experience? Playing Mahler’s Second Symphony, the Resurrection, with the New York Philharmonic with Leonard Bernstein conducting. We performed it many times with him, and it continued to move me at each and every performance. This work is a complete and glorious musical experience—the power of symphonic orchestration displayed in all its glory, to which Mahler thoughtfully placed a soulful aria as the fourth movement, and the inclusion of a chorus in the finale make it so. Having the most informed and inspirational interpreter of Mahler during our life time at the helm made this one of the most memorable musical experiences that I have had. Evangeline Benedetti. Photo courtesy of Nicholos Bruckman. What were some struggles you encountered when you were first beginning your career? Moving from my home in Austin, TX and adapting to New York City living was amongst the most trying that I experienced. The aspiration to attend the Manhattan School of Music and to study cello with Bernard Greenhouse was my driving force that powered the ability to endure the difficulty of settling in New York. Except for the summer that I attended Interlochen Music Camp before my senior year of high school, I had no experience on how to maneuver anywhere outside of Austin, much less New York City. MSM had no housing support at the time, so I moved five times, I believe, staying in each place no longer than a month, until I found a match for my living requirements at the Studio Club, a YWCA residence for single professional women, which no longer exits. Once there, I had a haven to live safely and easily,with just enough room to practice and at last a place conducive to intense study and practice. I actually have 18—the complete movements of the six Bach Suites. They are probably the most satisfying of the repertoire in their completeness. They are endlessly intriguing due to their complexity in form, rhythm, harmony and emotional content. They are for solo cello (without accompaniment), therefore affording the player complete freedom of expression as long as the mores of the style are taken into consideration. The content is so jam-packed that one can never cease to mine them. Perhaps they are the cellist’s bible. It would be Bach, because he wrote the Suites. He somehow understood the sensibilities of a cellist, actually, he seemed to know this for every instrumentalist. I would love to have a discussion with him to discover if he knew how he was able to do this, or if it was by musical intuition alone, which is what I suspect. What musical movement or type of music do you struggle to appreciate? In the classical genre, it is Philip Glass, John Adams, and others who are minimalists. I can admire their genius, but I do not have an emotional connection on any level—except for irritation at the repetition! In the popular vein, I have never had an affinity for much of it. After all, the Beatles came into stardom during my intense years of practicing, and I had no time to listen to them. I do not think that young musicians should be as narrow as I, but that’s where I was during that time. What inspired you to write this book? What helped you the most with the writing process? Once I began my studies as an Alexander Technique student, I began to revamp my playing to be more in tune with the principles of the technique. It began a quest for freedom of playing that I so longed for, and it afforded me answers that traditional teaching did not. After working many years to understand playing from this different point of view, I wanted to present a more or less complete picture of my lifetime of exploration, thought and practice. A book seemed to be the way to go. My writing process was greatly enhanced when Joseph Mace, DM, came into my sphere as my assistant and developmental editor. He helped me turn my ideas into conceptual wholes that formed the structure of the book. Tell us your favorite story about your time in the New York Philharmonic. The true story for me is really a novel that extended the 44 years that I lived the marvelous musical and personal experience of being in the Philharmonic. However, when thinking about personal stories, two come to mind. The first is a piece of history. When Philharmonic Hall (now David Geffen Hall) at Lincoln Center was built, they were certain that there would be no women in the orchestra. Fortunately, they were wrong, but they built no dressing rooms for women. Therefore when Orin O’Brien, the first tenured woman, and I, the second, won our respective auditions and were admitted to the orchestra, they originally solved the problem by having us change into our orchestral black costumes in a public women’s bathroom. They just put lockers in there. Finally after a few years and more women came aboard, they built a dressing room for us. I suppose they realised women were here to stay. The other was an incident when playing an outdoor concert in Central Park. An enormous beetle flew down my blouse and got stuck there for what seemed like an eternity. At long last, there was a pause in the cello part when in the presence of thousands of people enjoying the music on the lawn, I was finally able to release it. This was certainly an unexpected hazard of playing the cello! Featured image: “CELLO” by Robin Zebrowski. CC by 2.0 via Flickr. 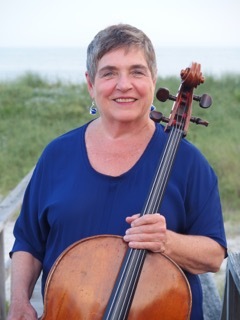 Evangeline Benedetti lives in New York City and teaches the cello and the Alexander Technique. 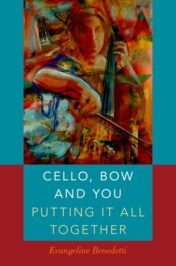 She is the author of Cello, Bow and You: Putting it All Together.